Display an announcement or promotion with our attractive Tent Cards. Four diagonal corners hold display cards firmly in place. Ribbon attached to the bottom of each side keeps the tent open and angled for easy viewing. Clear vinyl overlay sheets that fit over your inserts and tuck into the same four diagonal corners are available upon request. Get a quote by filling in our convenient contact form or call us toll-free at 1-888-478-5553 to speak to a real person. All tent cards are made with a smooth black vinyl with black linen panels (custom options are available). 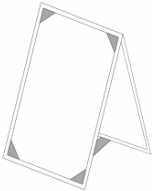 All tent cards are secured using Robertson Corners which will hold your inserts securely in place.